UCSC physicists developed silicon sensors and electronics for the inner tracker of the LHC's ATLAS detector, part of which is shown in this photo taken during testing. Photo by P. Ginter, CERN. Physicists involved in experiments at the Large Hadron Collider (LHC) have presented evidence of a new particle that may prove to be the long-sought Higgs boson. It remains to be seen, however, whether the properties of the newly discovered particle match the theoretically predicted properties of the Higgs boson. The findings were announced July 4 at the home of the LHC, the CERN particle-physics laboratory near Geneva, Switzerland. The new results are based on data collected in 2011 and 2012 by the LHC's two major experiments, ATLAS and CMS. Physicists at the Santa Cruz Institute for Particle Physics (SCIPP) at UC Santa Cruz helped spearhead U.S. participation in the LHC and have been working on the ATLAS project since 1994. "The results from the two experiments were very similar," said Jason Nielsen, associate professor of physics at UC Santa Cruz and deputy analysis support manager for U.S. ATLAS. "The rate at which the new particle is produced is consistent with the expectations from the Higgs boson--a little bit low for CMS and a little bit high for ATLAS. In addition, the two experiments now agree on the mass of the new particle. This is important because the Higgs boson mass is a fundamental part of the standard model of particle physics." The new particle is in the mass region around 125 to 126 billion electron-volts (particle physicists describe mass in terms of its energy equivalent). Publication of the analyses is expected around the end of July. Scientists will give more detailed presentations about the results this week at the International Conference on High Energy Physics in Melbourne, Australia. The existence of the Higgs boson is a key part of the theory that explains the masses of the fundamental particles. In the LHC, two counter-rotating beams of protons smash together at an energy of 8 trillion electron volts, producing hundreds of millions of collisions per second. If the standard model of particle physics is correct, these collisions should produce, on rare occasions, an extremely unstable Higgs boson, which would immediately decay into lighter elementary particles. Physicists look for evidence of the Higgs particle in these decay products. The results announced July 4 are preliminary, with further analysis of the 2012 data still under way. A more complete picture of the observations will emerge later this year after the LHC provides the experiments with more data. Theoretical physicists have predicted the rate at which the Higgs boson would be produced in high-energy proton-proton collisions at the LHC and also how it would decay into certain combinations of observable particles. Experimental physicists studying the collisions at the ATLAS and CMS experiments found evidence of a new particle, but more data are needed to verify that the properties of the discovered particle match in detail those expected for the Higgs boson. "To be confident that the new particle is a Higgs boson, you want to see it in multiple decay modes with rates that are not too far from the expectations based on the standard model," said Howard Haber, professor of physics at UCSC and coauthor of the 1989 book The Higgs Hunter's Guide. "Further data are required to provide the statistical precision needed to check whether the precise predictions for the Higgs boson of the standard model are realized, or whether there are deviations from the standard model. This should soon be possible since the LHC is running extremely well, and we anticipate that the data set collected by the end of this year will be three or four times larger than the present data set." The standard model of particle physics has proven to explain correctly the elementary particles and forces of nature through more than four decades of experimental tests. But it cannot, without the Higgs boson, explain how most of these particles acquire their mass, a key ingredient in the formation of our universe. Four of the theorists who initially proposed the Higgs mechanism in the 1960s--Francois Englert, Carl Hagen, Peter Higgs, and Gerald Guralnik--were present for the announcement at CERN. "There was a poignant moment at the end of the seminar when Professor Higgs stood up to offer his congratulations and say how incredible it was that it happened in his lifetime," Nielsen said. Abraham Seiden, professor of physics at UCSC, said the LHC has performed very well since it resumed activity this spring, operating at higher energy than in 2011. "The new data equal the total amount collected in 2011," Seiden said. "This has allowed the two large experiments at the LHC to further examine hints of a new state that appeared in the 2011 data. The new state fits the expectations for the long-sought Higgs boson." The team at SCIPP has been responsible for developing the silicon sensors and electronics for the ATLAS detector's inner tracker, which measures the trajectories of charged particles as they first emerge from the site of the collisions. The team has ongoing responsibilities for the tracker's operation and is also responsible for some of the particle identification software, including algorithms to identify photons and b quarks. The physics team at UCSC includes Nielsen, Seiden, Alex Grillo, Hartmut Sadrozinski, and Bruce Schumm, as well as many students and postdoctoral researchers. 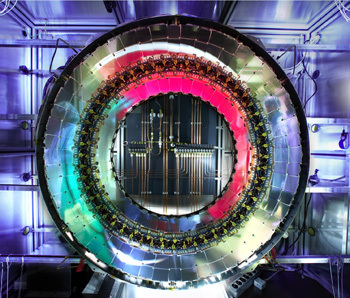 ATLAS is one of a number of international physics and astrophysics projects that have drawn on SCIPP's 25 years of experience developing sophisticated technology for tracking high-energy subatomic particles.